In moist climates hot fitting is practiced, because it is only by hot fitting that the shoe in such a climate will stay on. By hot fitting the shoe will get a perfect fit. In a brittle hoof there must also be a good fit, or the shoe will not stay on. In many countries hot fitting is practiced exclusively, and no bad result seems to follow, unless the foot is too much pared down and the shoe, while hot, held up against the foot too long. A foot may be just as much damaged by paring down too much. The author never practices hot fitting, except where there is a brittle hoof, or an animal is constantly scraping and kicking, so that it is difficult to make the shoe stay on. I fit cold, not because I think it better, but because the opinions of horse owners are against hot fitting, and I simply submit to the whim of my customers. A horseshoer who has practiced cold fitting all his life thinks hot fitting will ruin a horse and vice versa. 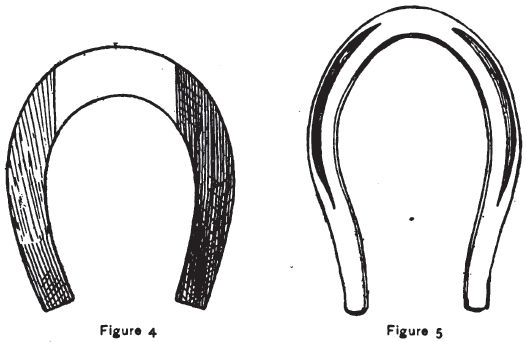 Experience with hot fitting has been had in our cavalry schools, covering a period of many years, and the results have been gratifying, as there was no damage done when the shoeing was properly performed, and the loss of shoes was 110 percent less than with cold fitting. 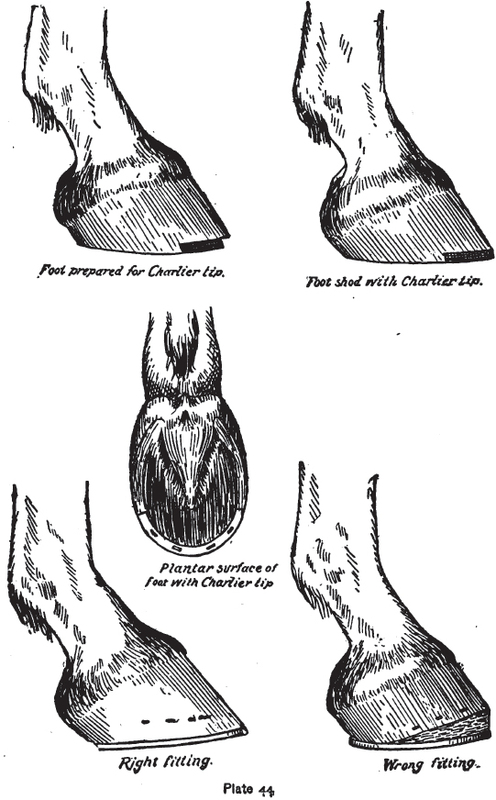 The advocates of hot fitting claim that it is beneficial to the feet, because it softens the foot, the hoof oil being pressed out of the part of the foot which would otherwise be cut off, and left as a coating on the bottom of the foot to rotect the same by closing the opened pores and preserving the natural moisture in the foot. Hot fitting will also soften the hoof, making it easier to drive the nails. It is hard to understand how it can be injurious to the foot to burn off some of the superfluous horn of the bottom of the foot, which must come off by some method or other. But if the sole is cut so thin that it will yield to the pressure of the thumb, and then a hot shoe is held there until it has embedded itself in the hoof, it is self-evident that such a procedure must hurt. The burning must be done with care, as must also the paring with the knife. For hot fitting, first pare the foot and level it, then heat the shoe all over to a red heat and touch it lightly against the foot, holding the hot shoe only a moment at a time to the foot. By a couple of touches like that there is no danger that the heat will penetrate to the sensitive laminae. The advocates of cold fitting claim that hot fitting burns the foot until it is brittle and crisp, frying the hoof like a steak, because the hot fitting shoers are too lazy to level the foot any other way. This cannot be true, because the foot must first be leveled in hot fitting the same as in cold fitting, and in addition to this, the shoe must be heated all over, which takes considerable time, so that nothing is gained in time by hot fitting. It is further claimed by cold fitter that the shoe will shrink when cold, making it too small for the impression made while hot. Thus we find exaggerations on both sides. For one farrier to burn the foot until the shop is full of smoke, and the foot is a steak, is barbarous. For another to carve, cut and rasp until the sole is so thin that it will yield under the thumb and the blood ooze out, is criminal. A bungler will ruin a horse, cold or hot fitting, while an artist will shoe a horse right with either method. I hope some tests will be given that will settle this controversy. At present one method is just as good as the other, when the work is properly performed. In one sense there is no such thing as cold fitting. All shoes are fitted while hot, but they are not all held to the foot while hot, so as to make an impression. Still, there are horseshoers who will cool the shoe off; touch it to the foot to see how it fits; re-heat it; touch it again to the foot; strike a few blows; cool it off again, and so on for a number of times. This is the most silly of all fittings. My opinion is that hot fitting will come to the front, because our most prominent veterinarians are already in favor of it. The shoes are seldom made by hand now, and when so made they are far inferior to ready-made shoes turned out by machinery, because no farrier or blacksmith can make a shoe by hand of such uniformity as the machine-made shoes possess. When the author learned the trade, shoes and nails were made by hand; but he is not now able to make either shoes or nails of such uniformity and finish as characterize the machine made shoes and nails. But he often hears about horseshoers telling their customers that the shoes must be made by hand in order to insure a good job, and of their charging an enormous price for such shoes. This is especially true in shoeing trotters. No smith, no matter how clever, can make two shoes by hand exactly alike, that would duplicate as machine-made shoes do. The same can also be said of nails. The shoe should be as large as possible, and the work the horse has to perform and his weight must be taken into consideration. 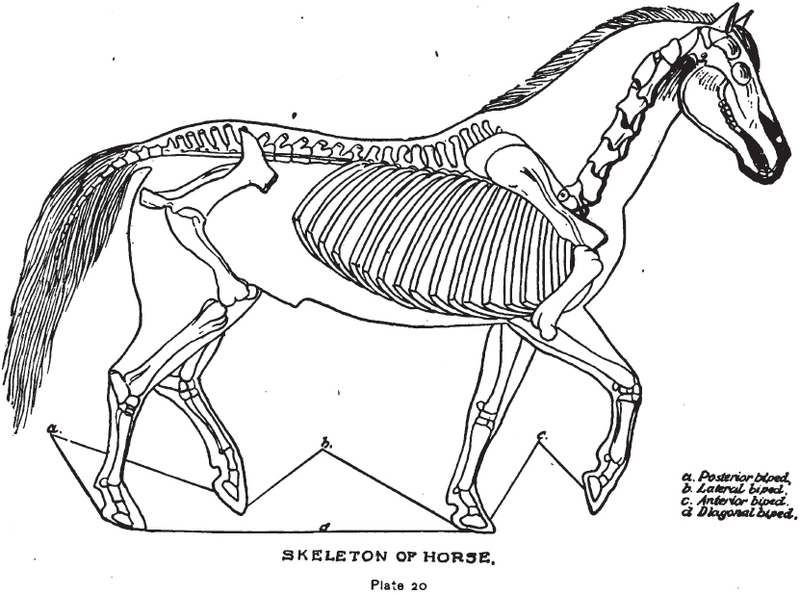 The horse should not be loaded down with iron. There is a good deal of truth in the maxim, “An ounce at the toe means a pound at the withers.” The calks should be low in order to keep the feet as close to the ground as possible. The purpose of the shoe is twofold: First, to prevent wearing of the foot; and second, to secure a sure grip or foothold. The first object will be attained just as well by the use of light as heavy shoes, and the second will be possible with short calks as well as high, provided they are sharp and suited to the roads and the work. The upper plane of the shoe or surface should be level. The old style of making the shoes was to make the web of the shoe incline from the outside inward. Although it cannot be proved that this shape will produce contraction as is claimed, it is just as well to make the shoes level. The shoe should be made to fit the foot, and not the foot to fit the shoe. It is generally the rule to make the shoe too much rounding on the toe. When this is done the shoe will have to be set back on the foot, or the front holes will be outside of the hoof; for it is in very few cases that the foot is round at the toe, as indicated by Fig. 4.